This is not my first post about cleaning tile and grout. This is something I have struggled with for years. We have steam cleaned our natural stone floors HERE, which was a time consuming process but the results were worth the effort. We have also color sealed our grout HERE, another process that completely transforms the look of tile. While steam cleaning and color sealing have worked well for us, what about intermittent cleaning and maintenance? I’m not about to rent a steam cleaner every time I want a deep cleaning on my travertine floors, it’s just not feasible. I have tried numerous floor and tile cleaners over the years, all have done an average to below average job of pulling dirt off the floors. I am thrilled to share with you a new product I found on Amazon that actually does what it claims to do! I tested a small area of flooring. I mixed the solution with water, roughly a 50% solution and 50% water ratio. This ratio mix is for a deep cleaning, for a lighter cleaning, more water should be added to the mix. After just a couple minutes, I wiped the area with a paper towel and a ton of dirt was lifted. I continued wiping the area several times with clean water and removed more dirt each time. I was truly amazed at how much filth was lifted. This heavy duty professional cleaning product HERE really works! I cleaned the entire kitchen floor and am very happy with the results. It cleans and degreases, also removes soap scum, mildew stains and algae. The cleaner can be used on granite, limestone, marble, slate, travertine, ceramic, porcelain, and grout. It is also great for stripping wax and floor finishes. I imagine to do that, you would not mix any water in with the solution, but use straight out of the bottle. As with any product, you should test a small area first to see the effects. I can’t wait to start using this product on my other floors and surfaces. Do you have a favorite product you love, please share! For more informative posts about amazing products that actually work, subscribe to Happy Haute Home and follow along on Pintrest HERE, and Twitter HERE and feel free to pin and tweet your favorite pics from Happy Haute Home. Your tile and grout look AMAZING! Read the reviews and they also said how well it works but said a lot of work. Can you tell me your method as the questions didn’t address that. Hi Denise, I used a strong mix of the solution, 1 part water to 1 part solution. Depending on the amount of soil, like light soil the bottle suggests using 4 parts water, etc. But yes, you do have to mop up several times with clean water to get all the dirt up. I have only used it one time, but I imagine with each subsequent time, it will get easier…if maintained properly. But I was shocked at how much dirt was removed! You are very welcome! I am excited the share this find! It’s so hard to find a good floor cleaner that really works! You are welcome Lynn! I am so happy to have found a good product that works too! Now that they are professionally cleaned, hopefully you can maintain them with this product. I really like it, thanks for visiting Sandra! Oh good! I hope you find it helpful Eileen. 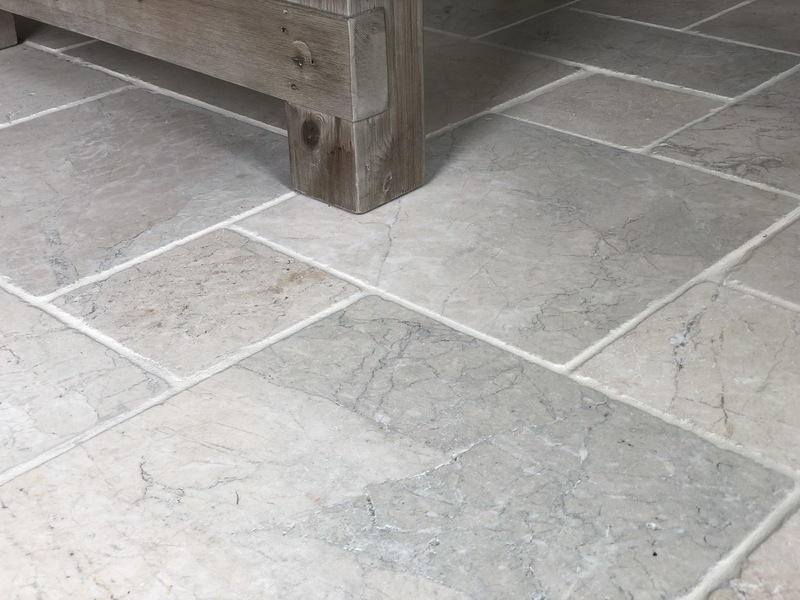 Another thing I do, not sure if I mentioned it in the post or not, but every so often, I use a hard brush on my floors to loosen the stubborn dirt that gets caught in the veins on my stone. I use it with the stone cleaner and it works great. Good Luck and thanks for visiting.